First things first, if you are traveling to Roatan simply as a tourist you will most likely (if you’re reading this) be granted a tourist visa upon entry. You do not need a visa if you are from many European countries, the U.S., Canada, or some Latin American countries. Upon entry at one of the airports or land border crossings, you will receive an entry stamp allowing you to stay in Honduras for up to 90 days. Some countries are granted less time, so be sure to review your entry stamp in your passport. If you would like to stay for an additional 30 days after your visa will expire, you may get an extension at an immigration office prior to its expiration. On Roatan, there is an immigration office in Coxen Hole and the process is fairly straight-forward. If you would like to stay on Roatan for longer than the maximum 120 days a tourist visa can grant you, you must leave the country for 72 hours before being allowed back in, at which point you will receive another tourist visa. With frequent direct flights to the U.S. or even cheaper flights to many other Central American countries (Belize, El Salvador, Guatemala, and Nicaragua are all incredibly convenient trips), visa runs are an easy option. Keep in mind they are not a cheap option, however. The cheapest flights will run you about $350 roundtrip, but flights to the U.S. will be over $500 and over $1,000 for certain destinations. Many people ask about extending their visa other ways. When I first moved here, everyone would renew their tourist visa at the airport. Since then, the airports have been equipped with fingerprint scanners and they electronically print entry/exit stamps into your passport. The 72-hour rule is now being enforced, whereas before it did not matter. That is the way things were, but it is no longer an option. If you are in Honduras on a tourist visa, you must leave the country for a minimum of 72 hours when your visa expires. Rentista: You must prove you have an income of a minimum $2,500/month from sources outside of Honduras, typically in the form of investments, bonds, properties, etc. Pensionado (Retiree): You must prove you have a lifetime income of a minimum $1,500/month from a private or public source as your retirement funds. So a regular pension will of course suffice. “Working” residency: If you are an owner or a key employee of a business, the business may sponsor your residency. A key employee must be able to prove his or her qualifications. For example, a qualified graduate of Le Cordon Bleu may be considered to be a key employee needed to run a resort’s restaurant, but if you’re just a good cook you’re out of luck. If you would like to start a new business, you will have to establish the corporation first, and then you can apply for your own personal residency based upon that corporate status. Family ties: The spouse, parent, or child of a Honduran may apply for residency based off of that family connection. Babies born in Honduras are Honduran citizens. As indicated above, if you plan to stay and work in Honduras you must apply for residency. It is illegal to work on a tourist visa. That being said, on Roatan there are many foreign workers who do not have residency. They can – at any time – be deported. In practice and in reality, foreign workers are allowed and are needed to maintain the tourism industry on the island. There simply are not enough Honduran SCUBA professionals to continue the industry. The Roatan Marine Park has a program through which they provide funding for locals to work toward the professional certification of Divemaster. However, their funding will run out in 2016 and as of now there is no promise of continuation. Beyond that funding expiring, there are more than 35 dive shops on this island alone, all of which require professionally certified Instructors and Divemasters. Until there are enough qualified locals to fill all of those positions, foreign workers are a necessity. Many of those foreign workers come for a short period of time – usually only 1 or 2 years. Between the cost of residency and the inability of many of these foreign workers to qualify under any of the aforementioned categories, there are many foreigners working on tourist visas. That is just the way it is. The tourism industry has grown enormously over the last decade on Roatan. Until infrastructure can catch up, there are foreign workers and business owners. Something I would personally love to see here is a vocational school for locals providing classes covering everything from computer skills, to sales and marketing techniques, to customer service skills. I’ve talked with many people about it, and it sounds like it may be a possibility in the near future. Hopefully it happens! If you are buying a house on Roatan, as a foreigner you can purchase up to 0.72 acres of property. If you would like to purchase a larger tract of land, or if you would like to purchase more than one property, you can establish a corporation to do so. If you are purchasing an existing business on Roatan, the business may continue to operate while you change the corporate documentation to reflect the change in ownership. If you are starting a new business on Roatan, it typically takes about 6 weeks to process the corporate documents to begin operating. Costs will usually run about $1,500 for all corporate documentation and authorization. All of this is designed to offer a mere guideline. You absolutely must use a Honduran attorney to process residency applications, corporation applications, and real estate purchases. Use a reputable attorney. Get advice from your real estate agent, from your neighbor, from your boss, whoever. Different law offices perform different functions, so be sure you’re covered. 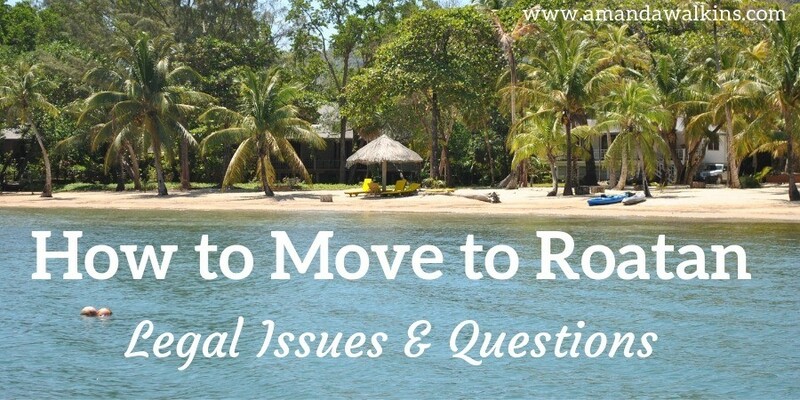 Again, the most important information I can offer regarding legal issues for moving to Roatan, starting a business in Roatan, or working in Roatan is to contact a Honduran attorney for personal advice.